The 4th of July may be an exciting holiday for you, keep in mind it may mean something entirely different to your pet. The 4th of July is a fun American holiday that presents a great opportunity to gather friends and family to celebrate America’s Independence Day and that’s a good thing. 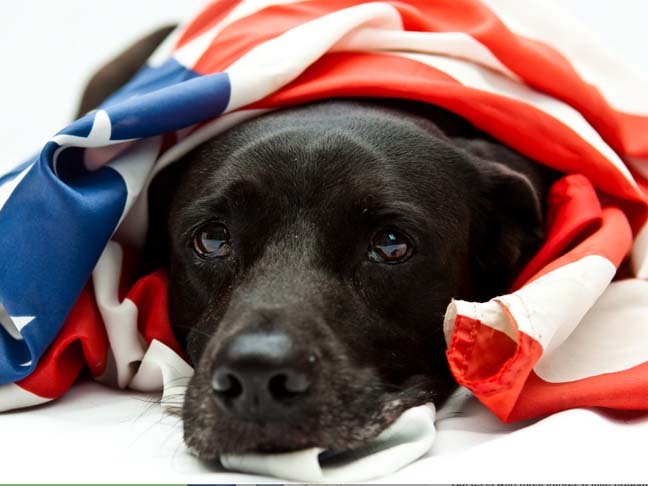 But if you really stop to think about the things that typically go along with a 4th of July Day celebration, many of them can leave your pet feeling unsafe and scared. But as is with most things, a little education and forethought can go a long way towards making sure that everyone (including your family pets!) can enjoy a safe and comfortable 4th of July this year. If you are going someplace other than your own home this year, consider leaving you pet at home. It’s a much better choice to simply leave your pet at home, instead of taking them into an unfamiliar and uncontrolled environment where they may not feel safe or could potentially get lost. While socializing is often a good thing for pets, there are many other opportunities, other than a potentially overwhelming 4th of July celebration, where you can take advantage of socialization opportunities for your pet. If you are celebrating at your own home, do not hang “glow” style toys on your pet or use things like sparklers or loud popping party party favors around your pet. The potential for ingesting unwanted items like these, could prove to be potentially dangerous to your pet’s health. If possible, avoid attending Parades or similar type events, since these events are predominantly intended for humans, not pets. Undoubtedly, your BBQ grill will be fired up on the 4th, so take care with things like lighter fluid and matches for obvious reasons. And feeding your pet random food scraps from the grill could be potentially dangerous to their digestive systems, and certain foods like grapes, raisins, onions, chocolate and avocado can actually be toxic for your pet. Also, never leave alcoholic beverages unattended around your pet, since ingesting alcohol could potentially be fatal for your pet too. Take extra care with items like citronella candles, insect repellent coils and oil repellent or fuel products, all of which could pose serious health problems for your pet if ingested or inhaled. Whether you are attending a fireworks display or not, keep in mind that if there are fireworks in the general vicinity of your home, dogs in particular may startled by the loud noise that fireworks create. So if you are aware that fireworks displays will be heard from your homes location, be sure you secure your pet within a confined environment that makes them feel the most secure. If your pet is crate trained, putting them in the crate and lightly covering it with a cloth may be the best place for them to be until the fireworks subside. You could also use soothing background music as a means to distract your pet from the fireworks sounds until they subside. Avoid spraying your pet with insect repellents or sunscreens that are intended for humans. Your pet may end up licking these products off and they can potentially be dangerous to their lungs, stomach and nervous systems. So as you can see, all of these 4th of July Pet Safety Tips are super simple to implement to keep your pets safe and secure this 4th of July. Now get out there with your friends and family and enjoy a safe and enjoyable 4th of July!